Content marketing has become a popular buzzword for brands in recent years, but creating a steady flow of relevant content isnâ€™t as easy as it sounds. In fact, when the Content Marketing Institute and MarketingProfs ran a joint survey last year, survey results showed that 64 percent of respondents cited producing content as their biggest challenge. Content marketing works well when itâ€™s done consistently, but without a long-term strategy and a commitment to producing content, many brands simply get frustrated and give up. Just look at the staggering number of corporate blogs that contain a handful blog posts and havenâ€™t been updated in months! However, some brands have found ways to reliably produce content and feed the content beast. Hereâ€™s a look at six ways to make content marketing sustainable as well as the pros and cons of each approach. Many brands have a full-time content strategist or a team of content creators whose main responsibility is to create content and repurpose thought leadership from senior employees on a regular basis. Pros: Having an in-house content person or team helps ensure a consistent brand voice and ensures that the organization has a steady flow of content. A dedicated content person can also add value to the organization by creating content best practices to be disseminated throughout the organization. Cons: Depending on the personâ€™s level of experience, this approach can cost $30,000 to $60,000 per year or more. Often you will need to spend time coaching that person on your organizationâ€™s perspective before they can work autonomously. Because of the high cost of full-time hires, some companies attempt to assign content marketing responsibilities to an existing marketing team member without adjusting their workload. In that scenario, content creation usually takes a back seat to more time-sensitive activities and doesnâ€™t get created on a regular basis. Some companies including Cambridge-based HubSpot enlist employees outside of the marketing department to contribute blog content. 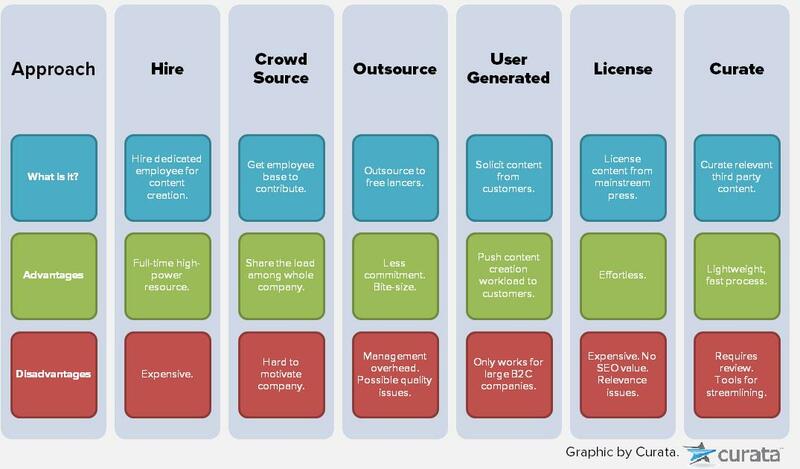 Pros: Crowdsourcing internally brings a greater diversity of voices and areas of expertise to your company blog. Plus, employees from other parts of the company such as customer service or sales may have deeper knowledge of the industry or customers than the marketing team. Cons: Coordinating content creation and ensuring some level of consistency isnâ€™t easy. Dedicated content marketing tools such as DivvyHQ and Kapost can help organize and maintain a content production schedule and workflow process, but employees outside of marketing rarely prioritize content creation over their other responsibilities. Even when you give prizes or perks to employees who create content, itâ€™s hard to sustain enthusiasm from all corners of the company long term. Rather than crowdsourcing from other departments of the organization, some companies turn to agencies like Brafton or services like Scripted, Contently, or Skyword to hire outside content creators. Pros: As your content marketing needs and strategy evolves, outsourcing allows you to scale up or down with relative ease. You can also hire content creators with a particular skillset more quickly than you could build or contract an in-house content team. Cons: Sometimes outside content content creators may not understand the nuances of your brandâ€™s voice as well as an internal person. The quality of outsourced content can also vary. It takes time and money to ensure a high-quality product, but if youâ€™re willing to invest that time and money, outsourcing can work well. User-generated content (UGC) is a popular way for well-known B2C brands to build content communities by soliciting stories relating to the brand from a happy customer base. Pros: Customer voices championing your brand provide an authenticity and social proof that your own content may lack. And engaging customers as brand evangelists can help deepen that relationship in the long term. Cons: With a considerable time investment, some B2C companies may be able to pull this off. However, most B2B companies lack a passionate user base who will take time to create meaningful content. Instead, B2B companies can conduct regular interviews with select customers and publish case studies, but itâ€™s still too time-intensive to become a mainstay of their content marketing strategy. Several media properties license content that you can syndicate and publish on your own site for a fee. Pros: Licensed content avoids the potential gray areas of fair use because youâ€™ve paid to reproduce the article in its entirety. If your organization has the money but lacks the time and resources to create or curate content, licensing it can be a huge time-saver. Also, because youâ€™re not linking to external content, you donâ€™t have to worry about sending readers away from your site. Cons: Search engines donâ€™t index licensed content so the SEO benefits are minimal. Also, the content must be published as is, so thereâ€™s no opportunity to make it your own by adding commentary from your brandâ€™s perspective. Licensed content is readily available on mainstream topics, but if you need niche content thatâ€™s relevant to your business, itâ€™s much harder to find. Another downside of licensed content is the cost involved. Depending on the length and complexity of the content, licensing it can cost up to tens of thousands of dollars per year. Content curation involves selectively finding, organizing and sharing the best content on your topic. Content curators typically share a small excerpt from the original text along with their own commentary and a link back to the original piece. Pros: Content curation is less expensive than licensing content and often more time-efficient than creating fresh content from scratch. Good content curation involves adding analysis from your brandâ€™s point of view, so this allows you to insert your brand voice into the broader online conversation. Also, because there is so much content readily available online, you will never lack for content or ideas. Cons: Content curation is fundamentally a human process, so it cannot be completely automated. You do have to take time to find interesting content, editorialize it and then publish it. Some content curators use a patchwork of tools like RSS and Google Alerts, there are also content curation tools like Curata that make it a seamless process that can be performed in as little as 20 minutes a day. FutureM will showcase "Innovation at Intersections"